Can you believe we are staring right at the beginning of November? It seems like not too long ago we were discussing all of the summer options for activities around Big Bear Lake. Now, we are blowing the dust off our winter gear and looking at the weather on a daily basis for a hint of snow. The golf course is now closed for the season, and the snow machines are warming up all around the area. Halloween is this week, and then we start moving towards Thanksgiving and big dinners with the family. The weather at night has been delightful for laying snow on the ground. Now we just need some of the good stuff! With the nightly temperatures dipping below freezing for a while now, it was just a question of time before the snow machines came out to get the party started. 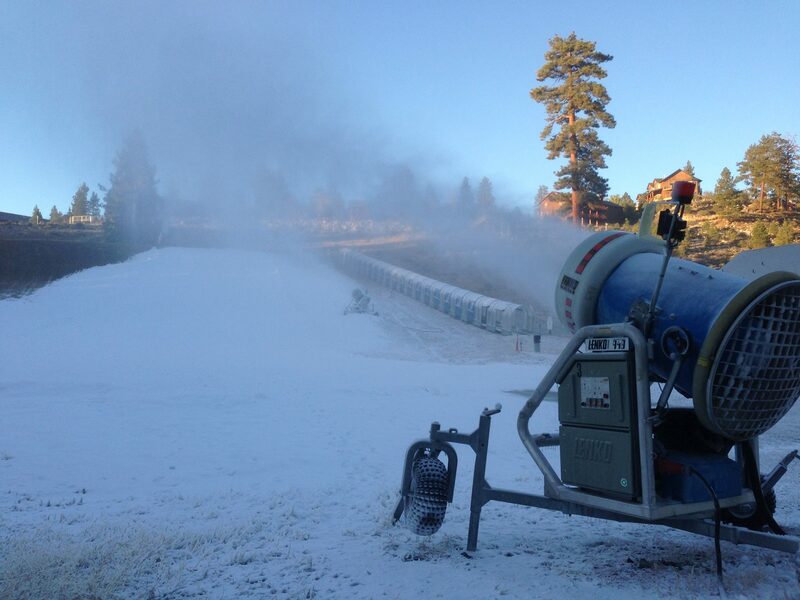 Big Bear Snow Play has been whipping up its own snow storm, and is now open for the season. It has a foot or three of powder to play on, and a warm lodge at the bottom to come to at the end of the day. Bear Mountain and Snow Summit are also rolling out the snow cannons, waiting for the weather to be just dry enough to fire a good powder for everyone to have fun in. This is not the time to just wait around for the snow! There are preparations to perform before you hit the slopes. Activities that range from working out and making sure your legs and core are ready to inspecting your skis, snowboards, and other gear that you’ll need soon. If you are bored with skiing and snowboarding, there are other snow sports to explore to get to the bottom of the mountain. We are all looking forward to some great snow, natural and man-made, to support what we are hoping is a very long snow season at Big Bear Lake. Maybe playing in the snow is not why you are coming to visit. Instead, you might need a warm fire, good company, and a place to relax and just be entertained. You could head to one of the many venues around Big Bear – all of them are filled this month with a wide range of acts from classic rock to original variety theater. You can also explore all of the local food and drink options, like the recently revamped Cowboy Express Steakhouse or El Jacalito in the Village. Have you taken some time to visit Chad’s Place in its new location? This is an excellent time to come and visit. We are looking forward to the icy grip of winter and all of the fun that will happen around the area. There is still a limited amount on time to enjoy the Sky Chair on your summer pass, or go for a ride on the Miss Liberty around the lake. We are here for all four seasons, and looking forward to you joining us for any of the activities you are looking forward to while you are here. As we write this, we can see rain falling outside the window and feel colder temperatures. Let’s hope that turns into snow this week! Gallery | This entry was posted in What to see and do and tagged Bear Mountain, Big Bear CA, big bear lake, skiing, Snow Summit, snowboarding, weather, What to Do, winter. Bookmark the permalink.